Mineral County is located in western Nevada and is approximately 2.4 million acres in size.A jurisdictional summary of land ownership is provided in Table 3-1 and presented in Figure 3-1. The vast majority of land within Mineral County is administered and managed by federal agencies. * Approximate values derived from BLM land ownership GIS database. The current population estimate for Mineral County is 4,687 persons (Nevada State Demographer 2003). Main employers in Mineral County include service industries, government, trades, and mining. The Nevada State Demographer’s Office lists Day & Zimmerman Hawthorne Corporation, the El Capitan, the Mineral County School District, and Kennecott Rawhide Mining as the largest employers in the County. (Nevada Commission on Economic Development, 2004). Elevations within the County range from 11,269 feet at Mt. Grant to 3,933 feet at Walker Lake. Primary mountain ranges include the Wassuk Range, Gillis Range and the Gabbs Valley Range. Other mountain features include the Excelsior Mountains, the Agai Pah Hills, the Garfield Hills, the Pilot Mountains and the Cedar Mountains. Major valleys are Gabbs Valley, Win Wan Valley, Queen Valley, Huntoon Valley, Alkali Valley, and Soda Spring Valley. Data collected from the resources listed in Section 2.1 indicate that there has been minimal wildland fire occurrence in Mineral County over the last 22 years. Table 3-2 summarizes the fire ignitions and acreages burned by year. 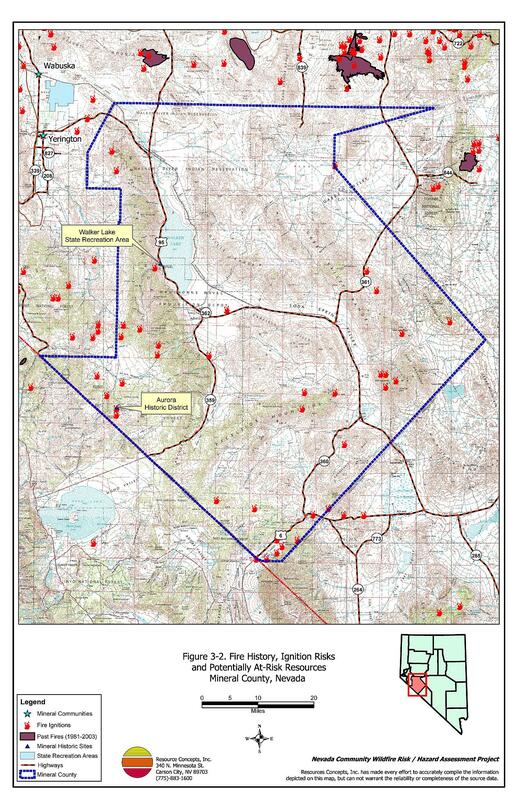 Figure 3-2 illustrates fire history on a map of Mineral County. Fire history data provided by the National Interagency Fire Center, Boise, Idaho. 1 Additional fire history information provided by BLM and USFS Nevada State Offices. Ignition risks for wildfires fall into two categories - lightning and human caused. Human caused ignitions can come from a variety of sources: fires started along highways and county roads from burning material thrown out of vehicle windows or ignited during auto accidents; off-road vehicles; railroads; arcing powerlines; agricultural fires; ditch burning; debris burning in piles or burn barrels; matches, and fireworks are a few examples of the different types of ignition sources for human caused wildfires. The ignition source records for Mineral County indicate that for 29 wildland fire incidents recorded, 21 of these were due to natural causes and 8 were human caused. The science of fire ecology is concerned with understanding how fire contributes to plant community structure and species composition. A fire regime is defined as the frequency and severity of fire occurrence in a given plant community. Fire frequency is controlled by the period of time required for the vegetation to recover from fire and reestablish vertical and horizontal continuity in the fuel beds. Natural fire regimes have been affected throughout most of Nevada by twentieth century fire suppression policies. Areas that formerly burned with high frequency but low intensity (fires more amenable to control and intervention) are now characterized by large accumulations of unburned fuels, which once ignited, will burn at higher intensities. Big sagebrush is the most common plant community in Nevada with an altered fire regime, now characterized by infrequent, high-intensity fires. In the aftermath of such fires, sagebrush requires a significant amount of time to reestablish. Most often, areas exposed to these high intensity fires provide the conditions for establishment and spread invasive species before sagebrush reestablishment can occur. The most common invasive species to reoccupy burned areas in northern Nevada is cheatgrass (Bromus tectorum). Cheatgrass is a common non-native annual grass that aggressively invades disturbed areas. Replacement of a native shrub/bunchgrass community with a cheatgrass monoculture increases the wildfire ignition risk, especially in late summer when desiccating winds and lightning activity are more prevalent. The potential fuel load in cheatgrass stands is highly variable and dependent upon winter and spring precipitation levels. In wet years, it can produce a fuel load of up to four tons per acre. It is therefore considered a high hazard fuel type. While this fuel type can pose a low fire behavior hazard in some years, being light and tending to burn with a relatively low intensity, it presents an extreme ignition risk with the propensity to rapidly burn into adjacent cover types, which may have higher potential for hazardous fire behavior. The ecologic risk of a fire spreading from a cheatgrass stand into an adjacent, unburned native cover type is that additional disturbed areas are thereby opened and vulnerable to cheatgrass invasion, and are subjected to potential loss of additional valuable natural resources such as wildlife habitat, soil stability, and watershed functions. Repeated burning of cheatgrass ultimately provides opportunity fro the establishment of noxious weeds and a greater variety of highly undesirable plant species. The approach to control cheatgrass once it becomes established is to deplete the soil seedbank by mowing in defensible space and firebreak areas annually before seed set, and on a larger, landscape scale, by implementing early-season intensive grazing up to and during flowering. Critical community features at risk of loss during a wildfire event can be economic assets such as agricultural and industrial resources or cultural features, such as historic structures, archaeological sites, and recreation-based resources. The agricultural land near Schurz is an example of a critical economic resource potentially at risk in the event of a wildfire. 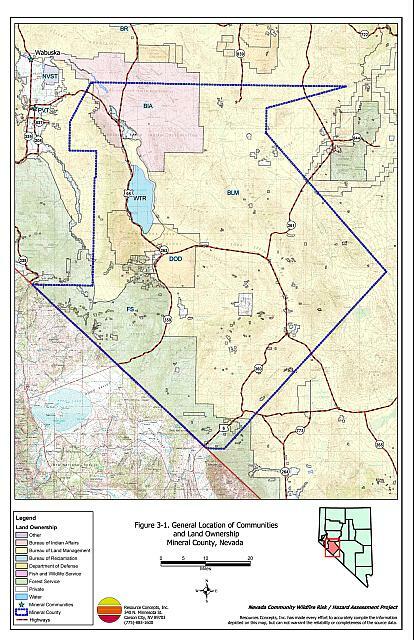 Operations related to the Hawthorne Army Depot represent the largest industrial activity in the state of Nevada, and as such, make it a critical economic feature for Mineral County. There is one historic district and three historic buildings listed on the National Register of Historical Places for Mineral County. The Nevada State Register of Historical Places also lists the three building sites. Historic districts, historic buildings, and resources that lie in the wildland-urban interface or could otherwise be negatively impacted by wildfire are summarized in Table 3-3. The Nevada Division of State Parks manages the Walker Lake State Recreation Area, located 11 miles north of Hawthorne on US Highway 95. The park is open year round and offers picnicking, restrooms, a boat launch, swimming, and fishing. Barbeque grills are provided, however, camping and campfires are not allowed. The locations of historic and recreation features in Mineral County are illustrated on Figure 3-2. There are 17 species with potential habitat in Mineral County that are listed as threatened or endangered under the Endangered Species Act or are otherwise protected by state legislation. 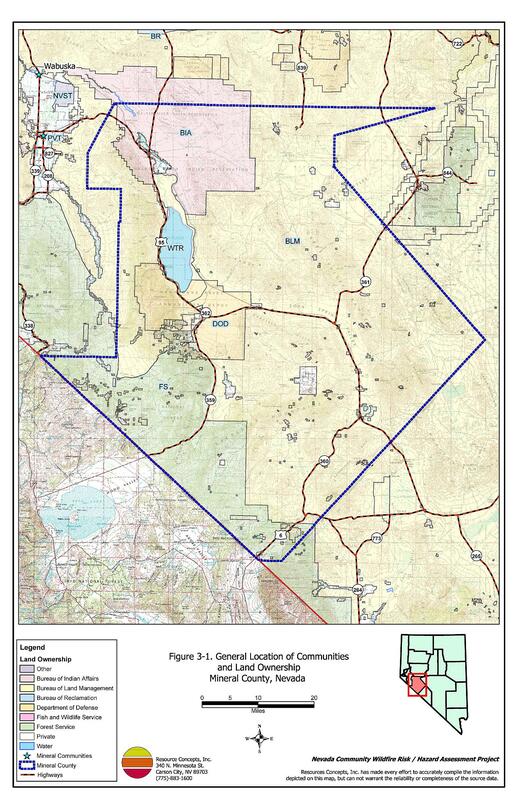 (Nevada Natural Heritage Program database; last updated for Mineral County 5 August 2002). These species are identified in Table 3-4. The Nevada Natural Heritage Program, the Nevada Division of Forestry, and the Nevada Department of Wildlife should be consulted regarding specific concerns and potential mitigation to minimize impacts to these species in the event of a catastrophic wildfire. There have been no planned fuel hazard reduction projects in Mineral County during the last 10 years.